The internet, according to some, is destroying our ability to maintain focus. Of course, our ability to maintain focus plays a key role in our work as lawyers. Reading a ten page memorandum dense with argument, analysis, complex factual patterns and case citation requires a good deal of focus. But, it may also require accessing the internet. Hence, the dilemma. So, here is a solution. Pomodoro Technique + Concentrate Software = Focusing. Scientists say juggling e-mail, phone calls and other incoming information can change how people think and behave. They say our ability to focus is being undermined by bursts of information.These play to a primitive impulse to respond to immediate opportunities and threats. The stimulation provokes excitement — a dopamine squirt — that researchers say can be addictive. In its absence, people feel bored. In sum, and contrary to most critics, lawyers are mammals and ‘ooh, look, shiny’ still applies. The Times article is a great read and a highly recommended to anyone who thinks they don’t have this focus problem. Pomodoro Technique ™creates a limited time where you focus on a single task. Knowing that this will be the time during which you focus, you key yourself to that task. For 25 minutes, you focus on nothing but the task at hand. At the end of 25 minutes, you take a five minute break. During that five minute break, get up, stretch, get a cup of coffee, check your email return a phone call. But get back to it after 5 minutes for another Pomodoro. 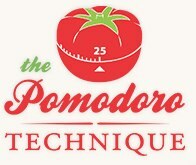 Lather, rinse, repeat and create a hash mark on a piece of paper for each Pomodoro you complete. Pomodoro, for you billable types, tailors nicely with the 2/10 (or even 1/10?) billable. Complete a Pomodoro, and you’ve finished up 4/10 of a billable hour. For you contingency types, Pomodoro can stop you from running wild with research and work on a case… there truly is no end to the amount of time you can spend on a single case. Now, bring a little muscle to bear. Pomodoro technique relies on a kitchen timer with a ‘ding’ to let you know when to break. Concentrate, is a handy piece of customizable software that blocks whatever you want to keep you from being bothered. It will shut off your IM, your email client and, if you tell it do so, will block designated web sites or even all access to the internet. And, it will do this for a set period of time so that you can’t sneek back, just to check and see how much more oil has spilled on that live video feed. Maclitigator recommends three different Pomodoro ‘types’ in Concentrate. All three shut down mail apps, set chat status to ‘away’ and play a ding at the end of 25 minutes. First up, PomoGoogleOK. This Concentrate pattern blocks most distraction domains (you can add whatever you want) such as flickr, groups.google.com, metafilter, facebook, twitter, video sites and mail.google.com. This Pomo allows you to search and research as needed on the broad internet without getting sucked into any of the typical distractions. PomoNoWeb does exactly what it says… no internet access at all. 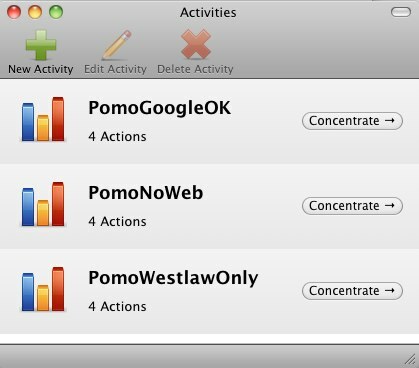 Finally, PomoWestlawOnly does just that as well. All internet access except Westlaw gets blocked. Concentrate is $29 and well worth it. Find the DND (“Do Not Disturb”) button on your desk phone. Push it when you start the Pomo. Find the sleep button on your cel phone. Push that button too. Find the door to your office. Close that. If necessary, tell your staff what you are doing and that you will be available later at a set time. Two things occur when using this technique. First, at the ‘ding,’ you will probably find yourself startled or feel a bit interrupted, as if you were just getting into the zone. That’s o.k. Take the break. You’ll be eager to pick up where you left off and you might even gain some additional insight while walking around. Second, if you do this regularly, you’ll begin to notice a flow. Working Pomodoro for a few days ends up creating the habit of working in 25 minute bursts and a certain ebb and flow will develop that carries over even when not formally running the clock. This entry was posted in software and tagged software by pete. Bookmark the permalink.